A gentle giant with a heart of gold is how best to describe Dikembe Mutombo Mpolondo Mukamba Jean-Jacques Wamutombo, one of the African continents greatest exports to the National Basketball Association (NBA). Simply known as Dikembe Mutombo all over the world, this legend now retired is back in South Africa to do what he does best when he is not playing basketball – giving back to the community – and through the annual Basketball Without Borders programme which is currently being held at the American International School of Johanneburg, where Mutombo and eleven of his colleagues from the NBA and WNBA are in the country to conduct coaching clinics and share their life’s experiences with 60 basketball players from 23 countries in the African continent.These young African players from different walks of life will for two more days get an experience of a life time by rubbing shoulders with some of the great names that have played the game of basketball and interacting with them. “For past 16 years that I have been involved with this programme I have seen many changes. But I still want young African players to have the same access to the game (basketball) that I had so that there can be more Dikembes coming from this continent. “They must also remember who they are and where they come from,” said the 43-year-old Mutombo. Mutombo also believes that the African players are getting the recognition they deserve in the NBA as they have made impact an the league. “Of course African players have been making an impact in the NBA, Hakeem Olajuwon who was a champion with the Houston Rockets and he has been in the top five for the most rebounds and blocks in the NBA and so have I,” said the former Denver Nuggets player, who rates Olajuwon as one of the toughest players he has ever played against. Standing at 7ft2 (2.18m tall), Mutombo is a very hard man to miss and he makes an impact where ever he goes and it was no suprise when he was quickly horded by the pupils of the American school, who were amazed at the Democratic Republic of Congo born player’s height and his custom made size 22 sneaks aptly-called Mutombo 55, the number he wore through out his playing career. Mutombo duly obliged the attention he received from the pupils, who asked everything from his shoe size, height and to those who did not know him, his name. 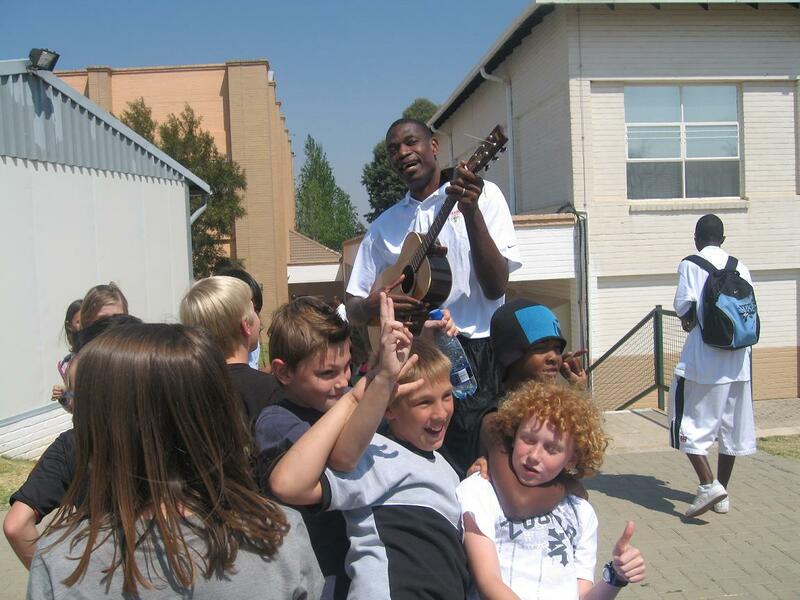 “I am Mutombo” he responds with a loud roar to his newly acquired young fans. “They love me in Africa that’s why I am always happy to be here,” said Mutombo who was a first round fourth pick in the 1991 NBA draft. Despite retiring from an illustriuos basketball career which has spanned 17 years, which has seen him play in two NBA finals, participate in eight NBA All Star games and break numerous records during his career. Now Mutombo’s focus is getting his knee better after battling with injury in his last season in the NBA, and focus on the his hospital which he built and named after his late mother “Biamba Marie Mutombo Hospital” and to also expand his business interests in Africa. “I want to get my knee better so can be able to walk without pain, I also want to look into other business ventures like oil and mining – Africa is very rich in resources,” said Mutombo. 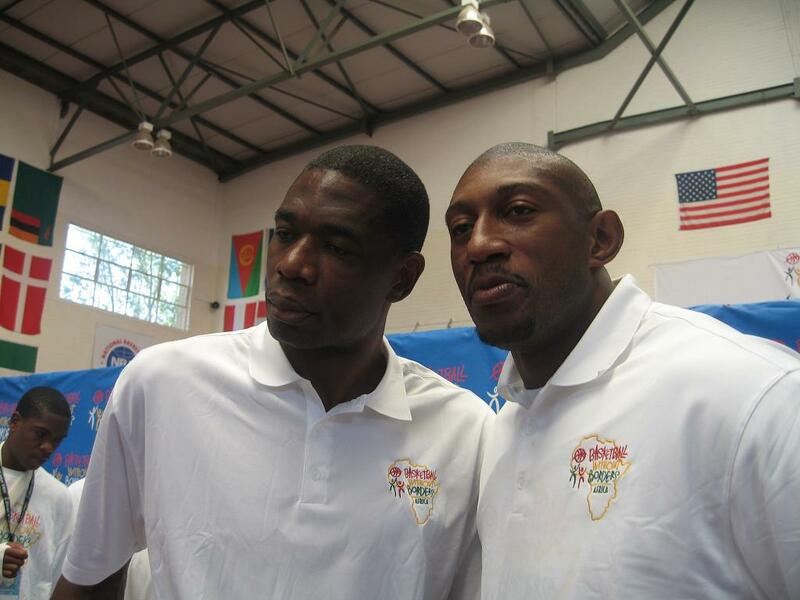 Mutombo also wants to continue with his charity work as it is part of the man’s nature. “I never stop giving to charity” said the man mountain. On summing up his basketball career Mutombo feels he has given his all in the sport and the sport has given back to him and he is happy with his contribution to basketball. “I am happy I have no regrets, I have played against some of the best players the sport has ever produced and I have also broken many records, so I am satisfied,” concluded Mutombo.